11 Best SEO Optimized & AdSense Friendly Responsive Blogger Templates – Hello, folks. As we all know, Blogger is the best platform to start blogging without investing a single coin. Every Professional blogger starts their career from the BlogSpot but the biggest problem we always face that we can’t find any SEO Optimized and AdSense Friendly Responsive Blogger Templates for our Blog so that we get search traffic from search engines. So, Here I brought 11 Best SEO Optimized & AdSense Friendly/Ready Blogger Templates. As you all know that to attract visitors we need a good looking and user-friendly designed template/theme so that readers will come again and again to visit your Blogger Blog. But only good designed templates are not enough to be successful in the Blogosphere; You should choose SEO optimized and also AdSense ready/friendly to become successful. These all Blogger Templates have many qualities like SEO Optimized, AdSense Friendly, User-friendly design (Responsive Layout), Looking Premium but Free, and much more features too. ATB Responsive Blogger Template is designed by Respectable Imran Uddin who is author and owner of AllTechBuzz.com. This template is fully responsive, SEO optimized, and also AdSense Friendly. You will not find any encrypted script inside the ATB Blogger Template. Fully SEO Optimized and Adsense Ready. Related Posts inside The Post Pages. 4 Column Stylish Footer Wrapper. 2 Column Layout and much more. Check This New Post – 21 Free Blogger Templates to Start a Professional Blog. ATB Eleven40 Blogger Template is the next version of ATB Responsive Blogger Template which is Most Advanced SEO Optimized and AdSense Friendly design made by Imran Uddin. In this template, you can find a lot of extra features compare of ATB Blogger Template. This template is also fast to load and used on many professional blogger blogs. If you want to read more about this template and want to download, then you have to read this post which I’ve published before – ATB Eleven40 Blogger Template. Recommended – Stylish Contact Form for Blogger Static Page. Elice is Premium looking free blogger template because it has many premium features. This template is designed by Chandeep who is the owner of blogtipsntricks.com. Elice blogger template is AdSense Friendly, SEO Optimized, Mobile Responsive, and User-friendly. Some more cool features of this template are given below. 2 Column Layout with an Opt-in custom form on the home page. 4 Column footer and Fast to loading. Elegant Look and Related Posts Widget in Post Pages. Highly User-Friendly and much more. BTNT is another best and highly User-Friendly Blogger Template by Chandeep. This templates will produce good impression to your visitor due to its simple WordPress style look. 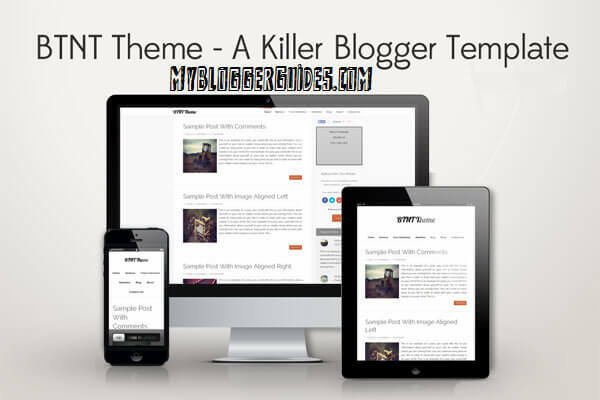 BTNT Blogger theme is fully SEO Optimized, highly user-friendly, and AdSense Ready. Few more useful features are given below. Simple Navigation Bar at The Top Right Side. SEO Optimized and AdSense Ready. Sidebar Subscribe Box with Social Icons is Inbuilt. Simple Footer Bar Where You Can Add Page Links. Subscription Box below Each Post. Related Posts Below Every Post. Ad Slot below Blog Each Post. Beautiful Read More button and a lot more excellent features. Tech Shadow Blogger Template is specially designed for technology and blogging niche blogs. You can see, there is two section placed in the header bar one for Blog Title/Logo and on the right side, you can add AdSense Ad or any other Ad Banner. SEO Optimized and AdSense Ready Template. 2 Column layout and 3 Column Footer Bar. Subscription Box Just Below of Navigation Bar. Socializing Wiget in Post Pages. Related Post Below Each Post. Auto Thumbnail Post on Home Page and much more impressive features. Sensational is a Most Advanced SEO Optimized and AdSense Friendly Blogger Template. It is professionally designed with two navigation bars one is horizontal, and another one is vertical on the left-hand side. Just like as Elice and BTNT this template is also created by Chandeep, but this template is next version which is designed by Rohit Asare (BloggerHero). Fast to Loading due to It’s neat & Clean Design. Highly SEO Optimized & AdSense Friendly Responsive Blogger Template. Social Profile Icons Widget and much more. Recommended – 7 Best Customized Blogger Scrollbar CSS Styles. Sevida is Best Responsive I Blogger Template designed by Themeforest. This template is highly user-friendly, Well SEO Optimized, AdSense Friendly, and well coded designed. List & Grid Mode Available. Highly SEO Optimized & AdSense Friendly. Well, Coded Neat & Clean Design. Use of AJAX and much more. Just like as Sevida, Apriezt Blogger Template is also eye-catchy, Highly SEO Optimized, AdSense Ready and well designed. It also has two navigation bars which you can use for linking static pages and posts. Two Featured Post Widget in Home Page. AdSense Friendly and SEO Optimized. Social Sharing Widget and Related Posts Widget in Every Post. Disqus, Facebook, and Blogger Commenting System. On-Screen Blogger Contact Form with Single Click Button. Attractive footer bar and a lot more. Purez Template is simple, clean blogger template. It’s perfect for portfolio or magazine blogger blogs. This Blogger Template is Highly User-Friendly, SEO Optimized, and AdSense Friendly with Responsive Layout. Tabs Widget Ready [Main & Sidebar Section]. Related Posts Widget and much more. Ijonkz has two styles boxed and full width. It is another responsive blogger template after Purez. Themeforest.net designs this template. This Template is highly user-friendly, SEO Optimized and AdSense Friendly. Facebook, Disqus, and Blogger Commenting System. SEO Optimized and Ads Ready. Integration of emoticons in Comments. Meta Keyword and Description Supportable. Tabs Widget in Sidebar Section. Pro-Admin Layout and much more. Bresponsive is another cool looking Professional Looking Premium Blogger Template. Implementation of Related Posts Widget below Each Post. Template Looks like WordPress Blog. 100% Responsive and much more. Must Read – 7 Best Blogger Templates for BlogSpot Blogs. So these are 11 Best SEO Optimized & AdSense Friendly Responsive Blogger Templates. I hope you’ve chosen one theme for your Blogger Blog. I’m sure, after using one of any template from above list, your search visits will improve day by day. 🙂 If you’re a WordPress user then check out these best Adsense optimized WordPress Themes. Very good post. All the templates are looking good. But I don’t think templates like Sevida are that much SEO friendly as they are heavy templates with lots of coding. Looking forward to hear your opinion about that. BTW very informative post though. Hey, Sumair. Thanks for your kind feedback about the post. Templates, which are highly and heavily coded does not mean that they’re not SEO friendly. I seen many professional blogs are using Sevida and they ranked higher on google. Really got a lot of information from this post. Thanks for sharing this post.